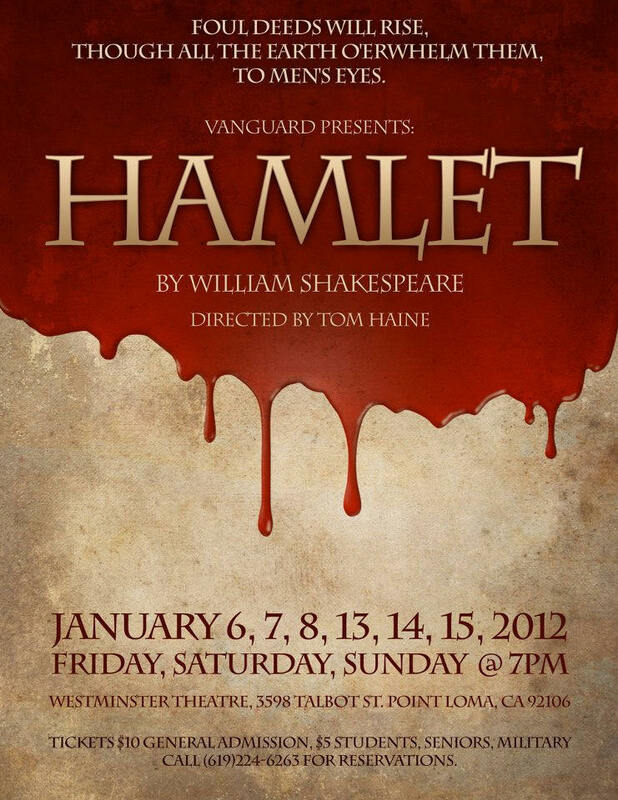 San Diego Shakespeare Society is co-hosting opening night of Vanguard’s new production of Hamlet. To celebrate Twelfth Night (January 6) and the opening of the show, stay for a post show gathering that includes hot drinks and Danish snacks, and an opportunity to meet the cast, director and crew. Directed by Tom Haine and featuring many SDSS favorite actors and members, this Hamlet aims to bring the play to you in direct and immediate way. A bare stage, minimal props and modern dress (just as it would have been for Shakespeare’s own actors) allows the text to shine. Curtain is at 7:00 pm followed by the gathering, included in your ticket price. Call Vanguard Theatre at 619-224-6263 for reservations. If you can’t make opening night, the show runs Jan 6, 7, 8, 13, 14 & 15 at 7:00 pm. There will also be a post show Q&A on Saturday January 14 with the actors and director.